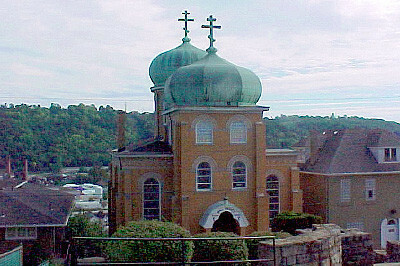 Holy Trinity Orthodox Church is located in Charleroi, PA, a city of the Monongahela Valley area, approximately 30 miles south of Pittsburgh. Take exit 40 (old exit 17), Charleroi. Proceed to the bottom of the exit ramp. At the stop sign turn left. Drive approx. 1 mile to Charleroi. Upon entering Charleroi, proceed through a series of lights on McKean Ave. At the 7th red light turn left onto 10th St (at Roderick’s Chirpractic Assoc). At stop sign (Fallowfield Ave), cross the street. Continue straight, then make a sharp left onto Lincoln Ave, then immediately turn right, up 10th St. Proceed up the hill, turning right onto Lookout Ave. The church is located on the right. 9:40 AM Hours; 10:00 AM Divine Liturgy. Fellowship hour follows Liturgy. 4:30 PM Great Vespers with Litiya and anointing; Confessions. 8:40 AM Hours, 9:00 AM Divine Liturgy followed by anointing with oil. On Sunday evenings during Great Lent, 6:00 PM Mission Vespers Service is held in different parishes of the Southwest Deanery (Mon Valley area) as scheduled. 7:00 PM, Holy Unction is held at one of the parishes of the Deanery as scheduled. Please call the Rectory at 724-483-4441 for schedule of other services, or to arrange Baptisms, Marriages, Memorials, Thanksgiving Services, etc. Holy Trinity Orthodox Church (originally known as Saint John the Baptist Russian Orthodox Church) of Charleroi, PA was founded in 1901 by a group of immigrants from the Austro-Hungarian Empire. These religious pioneers came to America seeking a better life for themselves and their families. At that time, Holy Trinity Orthodox Church was the second oldest Russian Orthodox Church west of the Alleghenies. The Rev. Vladimir Kalnev served as the church’s first priest, ministering 75 parishioners from Charleroi and surrounding towns in the Mon Valley area. After a fire destroyed the original church in 1923, a group of parishioners built a new place of worship that was consecrated in 1926 by Metropolitan Platon. During the difficult Depression years, the Very Rev. Gregory Soroka was instrumental in personally raising funds by his continuous visitations to all the members of his flock. Fr. Gregory was succeeded by his son, the Very Rev. Vladimir Soroka. Fr. Vladimir who followed in is father’s steps was well known for his contributions to the sacred music of the Orthodox Church. Despite its many challenges, Holy Trinity Orthodox Church has undergone extensive renovations, added a fully equipped kitchen and built two different rectories. Throughout the years, church organizations have played a key role in the life of Holy Trinity Orthodox Church, including the Church choir, “R” Club, Ladies Altar Society, St. Herman’s Fellowship Club, and the Church School. Since 1901, 26 priests have served at Holy Trinity Orthodox Church, including the present priest Very Rev. Gregory Peterson Ph.D., who has served at the church since Jan. 2001. The parishioners of Holy Trinity Orthodox Church thank God for all of His blessings which have been extended to them. They also express their gratitude to all those who labored and made great sacrifices for the well-being of our beloved church. May God grant Memory Eternal to all the departed priests and parishioners who have fallen asleep in the Lord! May their Memory be Eternal!